On his 18th album, David Bromberg teaches a master-class not only in the history of blues-inflected Americana but also in how to keep that music alive and relevant. David Bromberg is a godfather of Americana, his career spanning all areas of American roots music whether as a sideman, a solo artist, or a bandleader. A multi-instrumentalist of the highest prowess, he has recorded with Richie Havens, Bonnie Raitt, Carly Simon, Willie Nelson, and Bob Dylan. After a highly prolific early period, having been signed to Columbia Records following an impromptu set at 1970’s Isle of Wight Festival, Bromberg stepped away from recording in 1990. During his long hiatus, which ended with 2007’s Try Me One More Time, he devoted time to becoming a master violin builder/repairman. He now splits his time between quietly running his violin shop in Wilmington, Delaware, and making joyful noise whenever the spirit moves him. 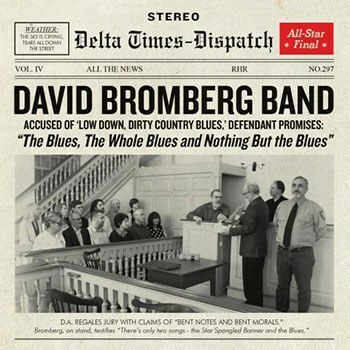 The spirit is in full motion on The Blues, the Whole Blues and Nothing But the Blues, recorded with the David Bromberg Band -- Butch Amiot (bass), Josh Kanusky (drums), Mark Cosgrove (guitar), Nate Grower (fiddle), and Peter Ecklund (cornet) -- and produced by Larry Campbell. The album is a master-class in blues-oriented Americana as Bromberg and his accompanists bring to life a collection of 11 smartly chosen covers and two Bromberg originals that fit seamlessly into the flow. The album opens with a Howlin’ Wolf-inspired riff that electrifies Robert Johnson’s “Walkin’ Blues” and sets the tone for what’s to come. These aren’t museum pieces; Bromberg and band breathe new life into these old songs, paying homage to folk song traditions while making music in the now. The big blues band sound of “How Come My Dog Don’t Bark When You Come ‘Round” turns this unattributed and almost lost song from the clueless cuckold tradition of the medicine show era into a barn burner. Similarly, the band embraces the hokum blues of John Willey Henry’s “You Been a Good Old Wagon”. These songs also reflect Bromberg’s longstanding affection for humor in song, and his delivery maximizes the comic effect. The band jumps from one folk tradition to the next with finesse, turning Sonny Boy Williamson’s “Eyesight to the Blind” into a Chicago blues strut, while going full-on gospel with “Yield Not to Temptation”. “900 Miles” becomes another low-burn scorcher given the full band treatment, with Bromberg coaxing a wailing train whistle from his guitar that gives way to a driving lead solo. Bromberg plays slower here than earlier in his career, going for depth instead of flair. Bromberg’s voice, too, has weathered and matured into an evocative instrument, its wavering on Ray Charles’ “A Fool for You” adding another emotional layer to the song. That world-weary voice combines with his sparse playing to haunt the listener of “Delia” (not to be confused with the version Johnny Cash recorded) with a chilling refrain of “She’s all I got is gone”. The band fills out each song handily, its unusual instrumentation (violin... cornet!) making more sense with each track. Early American music, after all, had lots of room for a variety of instruments before getting somewhat formalized during the folk revivalist periods of the '60s and '80s. The precision of the players and the interplay of instruments gives them the freedom to move from the country blues of the Mississippi Delta to the jug band tradition of the urban South, and from New Orleans to Chicago, embracing the breadth of American music in its myriad places and times. In doing so, they have made a timeless album for the current moment.